You can be sitting on the bus or train, in a café or library and a great idea for a poem, novel, song lyric comes to you. 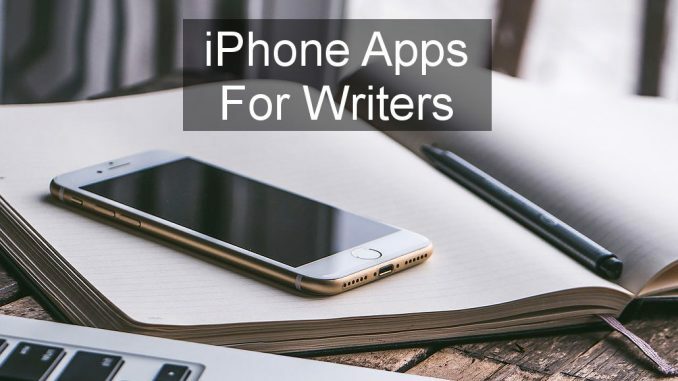 With these iPhone apps you can write anywhere and anytime. If you are a writer or a blogger you are probably thinking about your next novel, web article or other literary work and ideas can come to you at unexpected times and places. With an iPhone in your pocket you can quickly get it out and record your thoughts, ideas, song lyrics, poetry or the next part of your novel. 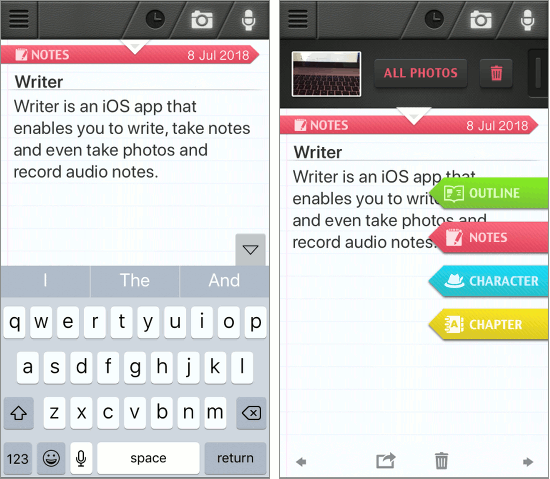 The apps here can be used to store notes for writing projects or you could even write a whole novel with outline, characters and chapters. Being able to write on the go means you can get more done and finish projects faster by writing whenever you have ideas or a few minutes to spare. Hitcents and actor Tom Hanks partnered to produce a writing app for the iPhone that emulates an old fashioned mechanical typewriter. 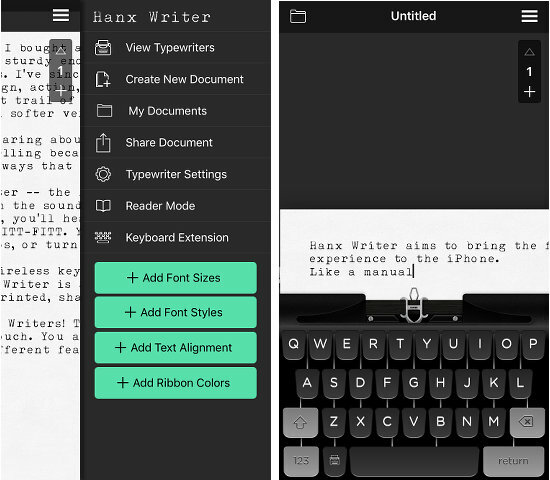 Hanx aims to bring the full click clack typewriting experience to iOS devices and like a manual typewriter it is noisy, and the paper jerks to the left with every character entered. When you reach the right-hand edge of the paper it slides to the right and you start a new line on the left. As a typewriter emulator, Hanx is excellent and very entertaining, at least for while, but it is not so good as a writing tool. The iPhone’s keyboard is replaced with a typewriter design and one is available for free with several others available for purchase. It looks and sounds like the real thing when you are typing on it. The main problem is the document being written cannot completely be seen when typing because half the paper is off the left or right side of the screen. It can be viewed full screen in reader mode, but not while the keyboard is showing. Only one document can be created and you are required to purchase another typewriter to unlock multiple documents. They are cheap, but one document is limiting. The usual iOS features like select, copy, paste, share and so on are all available, but to me Hanx Writer is more of a fun novelty app than a serious writing tool. 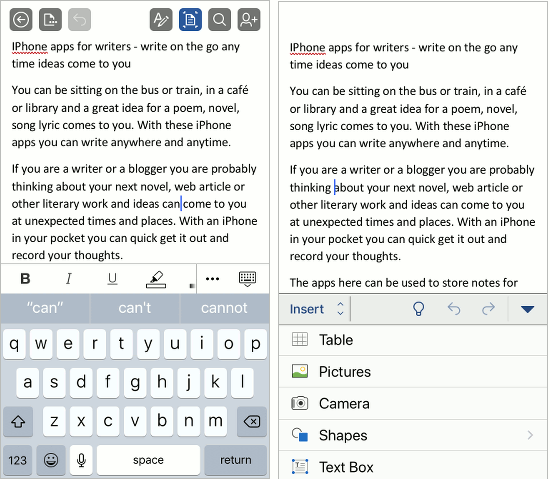 Writer is a very useful iPhone app that could be used for any general-purpose writing task but it has special features for writing books that help you organise and create the content. On the home screen you can create a new document and when the editor appears you can then assign a colour-coded label like Outline, Notes, Character and Chapter. You can therefore build the characters and their attributes, store bits of information and ideas in the notes, and write an outline of the plot or structure of the book. The main body text can be assigned a Chapter label. The Writer app can also take photos and these are stored with the notes. Audio can be recorded and stored too. Desktop software does all this better, but for a mobile app you can carry in your pocket it is very useful. It lets you write, take notes, store photos and audio recordings and plan your plot and characters. Payment is required to create more than four notes, but it is a cheap app that costs very little (UK £2.99). 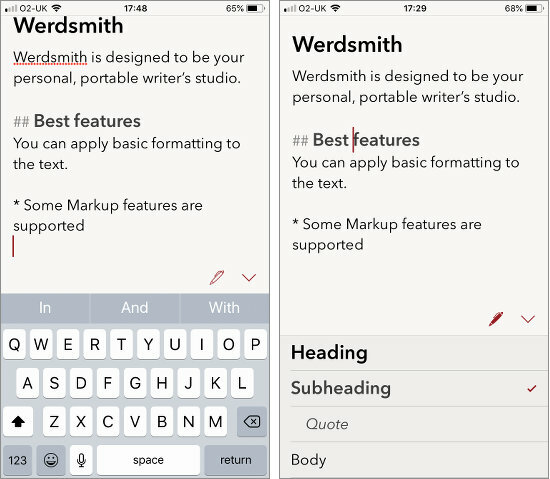 Werdsmith is another interesting app for writers and it could be used for general purpose notes and writing or even for longer projects. You probably would not want to write a book using it though. On the home screen are two tabs and these enable you to create and store ideas or projects. Both are basically notes and both use the same text editor. The separation of notes and projects aims to help with organisation. The text editor is interesting because it supports a limited range of styling features. For example, you can make text bold, italic or hidden, and choose between heading, subheading, quote and body text. The number of words is displayed at the bottom of the screen and tapping it opens a statistics panel that is useful. It shows the words, words written, reading length, and time spent writing. There is also a word goal to help you focus and encourage you to write. The app can even remind you to write at certain times of the day. Werdsmith is quite good but it is too expensive for me at £44.99 a year. For a little more you could get Microsoft Office with Word, Excel PowerPoint, OneNote and more, 1TB of online storage and apps for PC, Mac, web, phone and tablet. 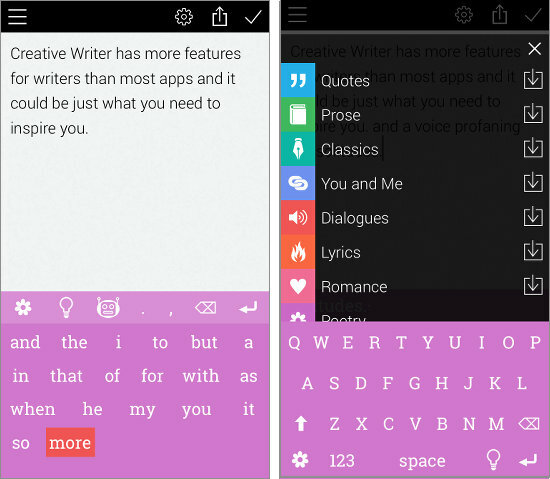 Creative Writer has more features for writers than some apps and it could be just what you need to inspire you. On the other hand, it might just be irritating. The app enables you to create notes as you might expect, but at the bottom of the blank screen is a collection of words where you would normally find a keyboard. The idea is that the words inspire you and suggest what should come next in the text. Tap the gear icon, which looks more like a flower, and an (almost) normal keyboard appears so you can type text normally and the word suggestions are reduced to one line. In theory it sounds useful but I didn’t like it for my writing tasks, however, you can switch to the normal iOS keyboard easily enough. A light bulb icon is used to access various paid feature upgrades and these include quotes, poetry features, cooking recipes, dictionaries and more. Their purpose is to give you an endless supply of ideas for your writing in the form of expressions, song lyrics, movies, and other sources. I had some problems with the interface with this app, so it wasn’t my favourite. Word hardly needs introducing because it is so well known and is so widely used in offices on desktop computers. It is an excellent word processor on the PC and Mac, but what about mobile? The iPhone app is also very good and it is one of the best word processors available for the device. The only downside is the large size and Microsoft apps, although good, take up a lot of space. If space isn’t a problem, go and get it. The Word app has a lot of features and so there is a steep learning curve when you first use the app and you need to get to know the features and how to access them before you can use the app efficiently. It does not provide every feature of the desktop Word application, but it does provide a large number of them and it is compatible with documents created on the web and on the desktop. It isn’t possible to cover all the features because there are so many. For example, on the Insert menu is Page, Table, Pictures, Camera, Shapes, Text Box, Link, Comment, Header & Footer, Footnote and Endnote. Some of these have submenus that lead to more options. Word is free on the iPhone and also on the OneDrive website. Documents are saved to OneDrive and can be accessed using Microsoft Office running on a computer, using the free OneDrive web apps, and using the free iPhone and iPad apps. There is nothing specific for writers, such as notes, characters, chapters and so on, but you can create separate files for these or even use the free OneNote app to store them. Word for the iPhone is recommended. Microsoft Word is brilliant and it has more features than most writers need in a mobile app because it is designed to enable people using Office on their PC or Mac to continue working on their phone or tablet. Can an app have too many features? Writer: Write A Book, write a story is much simpler but stood out because it enables you to create notes with labels for characters, outlines, chapters and so on. It also captures audio notes and photos as well. There is also a cheap upgrade to the full version with unlimited notes.